Happy New Year! You may have heard in the last post that some big additions are on the way to welcome you into the new year. That will just be the start for 2013. We're on course to bring you many new things to revolutionize the way you do email marketing. We thought we'd kick off the new year by letting you know about a couple of new features we released that you can begin enjoying now. 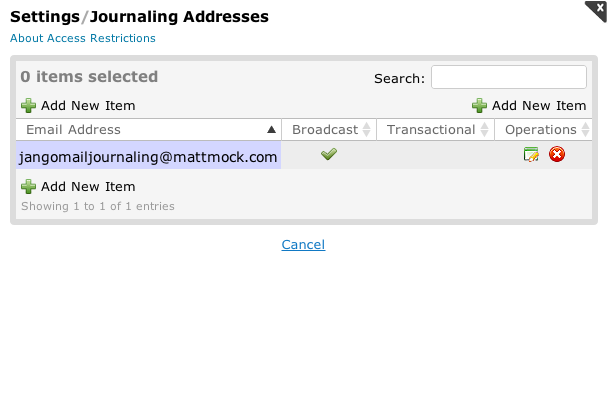 We added a feature to JangoMail that we call "Journaling Addresses." These are email addresses you can add to your account that will receive a receipt (copy) of every outgoing email that is sent through the relay, our website, or with the API. With journaling addresses, keeping an accurate history of all outgoing communications for internal audit purposes couldn't be more simple. Go to Settings --> Authoring --> Journaling Addresses. Add your journaling addresses. Make sure to specify if the journaling address should apply for your broadcast sending, your transactional sending, or both. Journaling Addresses receive a copy of every email that is transmitted with all headers intact in the way they were originally crafted by you before initiating the send. For example, if you sent an email to a recipient with 4 cc's and 4 bcc's, you will see all of these recipients under the proper heading (to/cc/bcc) in the email sent to the journaling address, so you can have a real, traceable audit of all emails that were sent. 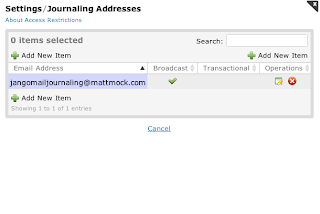 Note: For now, we have a hard limit of 5 journaling addresses that you can use for broadcast sending. This could change in the future, especially with your request. We made some modifications to how bcc and cc's work. Plain and simple, we added the capability for you to specify multiple cc's and bcc's in your email via the SendTransactionalEmail API Method, the SendMassEmail API Method, the web interface at JangoMail.com, or even with transactional email passed through the relay--And we made sure that they're displayed exactly how you want them displayed for every end-recipient. Simply separate multiple addresses in the CC and BCC fields with a comma. See the SendTransactionalEmail help page and the SendMassEmail help page for more information. Compose your email normally with your email client, via your website, or your web application, specifying the cc/bcc addresses as you normally would. Send your email via the relay server at relay.jangosmtp.net as you normally would, and leave the rest up to us. For now, we have a hard limit of 5 cc and 5 bcc addresses that you can specify for all broadcast mail (not including transactional mail or mail sent with the SendTransactionalEmail API method). This limit could be increased in the future especially with your request. Watch out for our new friend, Jack the Jangolope who will be making his public appearance shortly as our new mascot. As we look forward to the many new advances the new year will bring, we thank you for being our loyal customers. The new JangoMail.com is live!